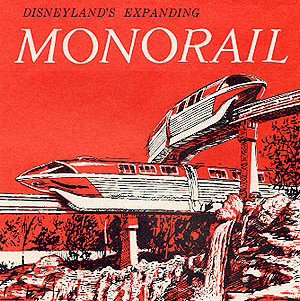 If reading about monorails on The Monorail Society Website isnt enough to satisfy your need to see monorails, this feature may be of some help. This is an updated reprisal of one of our most popular Collectible Corner articles from the pre-website, newsletter days (Monorail Newsletter - Volume VII, Issue I, Winter 1996, to be exact). Being avid collectors of monorail-related items, The Monorail Society (TMS) archives include an interesting assortment of old toys, postcards, posters, operator keys, buttons, t-shirts, and even a used Seattle Alweg Monorail guide wheel. But some of my favorite collectibles are the videos and DVDs of movies or TV shows that feature monorails. I have collected some of them right off TV and for others Ive splurged and bought ready-made videotapes or DVDs. whenever you want, right there in the confines of your own residence. Monorails have been featured in all sorts of productions, and why not? Even though they have been around for over 100 years, they are still thought of as transit of the future. They are not only efficient, but also fascinating to the general public. When people find something fascinating, Hollywood is right there to capture it on film. For the following listing, titles are followed by a classification and year of production. TV indicates that the clip or show was produced exclusively for television and youll probably need a VCR or digital video recorder to get it. Movie indicates that it was released originally for motion picture theatres. If TV or Movie are following by the word Video or DVD, that means it was released on video or DVD at one point. Since availability for these formats changes all the time, a little research on your part will be required to find them, if you wish to add them to your collection. 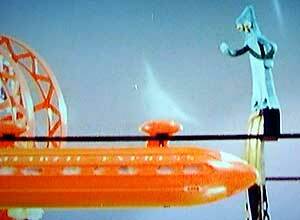 At Car City, Pokey gets snagged by a passing suspended monorail. 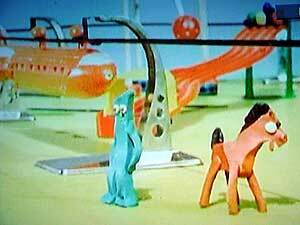 Gumby climbs up on a monorail pylon and stops the train, then boards it to ride with Pokey. Gumby orders "Halt!" from a monorail pylon. This special live broadcast TV show was originally broadcast on ABC to highlight Disneylands huge expansion of 1959, when the Submarine Voyage, the Matterhorn Bobsleds and the Disneyland-Alweg Monorail opened together in one of the park's largest expansions. Originally broadcast in black in white, it was captured via kinescope (filming of the TV screen). Only recently was the film discovered and released on a DVD set titled "Walt Disney Treasures - Your Host, Walt Disney." The famous first passenger run of the Mark I, which included then Vice President Richard Nixon and family, is well captured. On hand was a camera high upon a crane, which views the monorail making its way around the circled figure 8, two years before the track was extended to the Disneyland Hotel. This DVD set is a must-have for Disney monorail fans and Disney park fans alike. George Pal's adaptation of H.G. Wells' novel stars Rod Taylor as the Victorian scientist whose invention catapults him thousands of years into the future. At one point in the 20th century, worldwide nuclear war is breaking out. 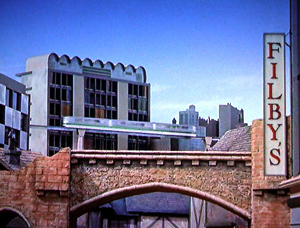 Rod Taylor and Alan Young are in the midst of conversation about getting away from impending nuke explosions, yet Young stops talking to turn his head and watch a monorail cross by (probably because the sound is that of elevated steel-on-steel rail). Its a quick clip, but funny enough to add to the list. This episode of the Disneyland TV show updated Walts large TV audience on improvements to his park in its 6th year. 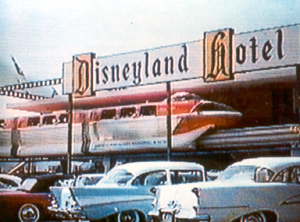 One major improvement was the extension of the monorail to the Disneyland Hotel, changing it from a ride into a transit monorail. Another Disneyland TV series update of progress at the park. 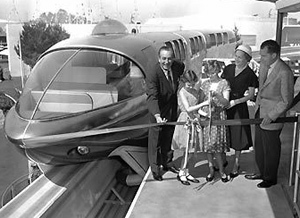 This episode features the famous Monorail Song as we watch the beautiful new Mark II monorails working their way from the then-new station at Disneyland Hotel to Tomorrowland in the park.